I had about 36 hours this week that was 'our normal' so I took advantage of it and started on my long 'to-do' list! Start another jar of cider fire. Done, actually, I did two jars!!! Make elderberry gummy bears. Didn’t get done! 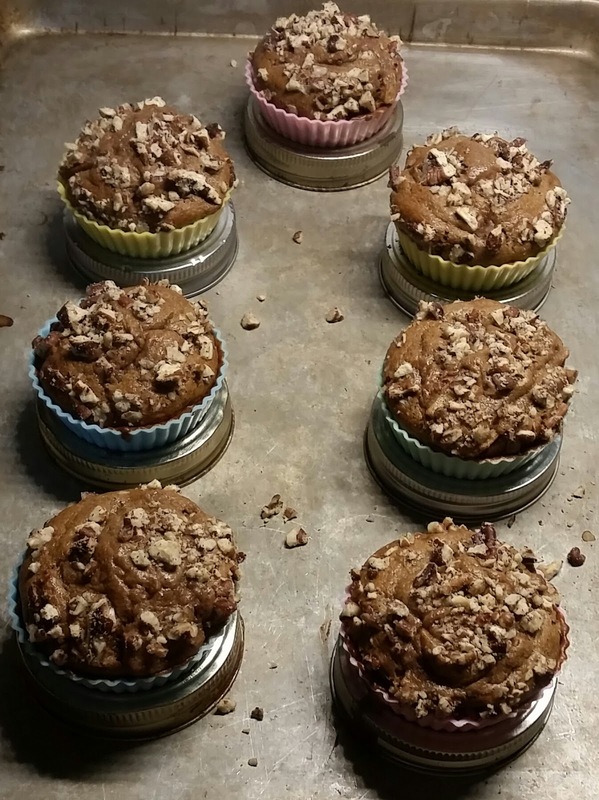 I made these delicious Apple Pie grain-free, almond flour free and coconut flour free muffins! I really liked them and will make them again! I’ve been watching my basil grow for the past 4 weeks but all I could do was glance at it on the way to and from our vehicle. This weekend I harvested it and preserved it using salt. Here’s a video on how to do it as well. 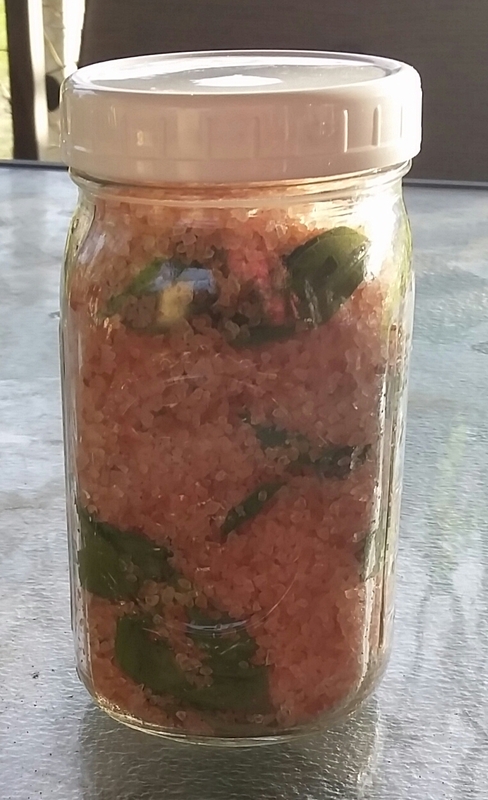 I'm looking forward to having fresh like basil as well as basil flavored salt to use in cooking! This jar actually has a lot of basil leaves in it, you just can't tell it by looking at it! I started cleaning out our raised beds, I plan to plant fall greens in one, garlic in another and so on …. While my husband mowed the yard this week, I cleaned up the debris that Hurricane Michael left. I also dumped out several containers of water that had filled back up from the rains that Michael brought. We are fighting an ongoing battle with mosquitoes right now and Hurricane Michael didn’t help at all so standing water of any kind is a big no-no! 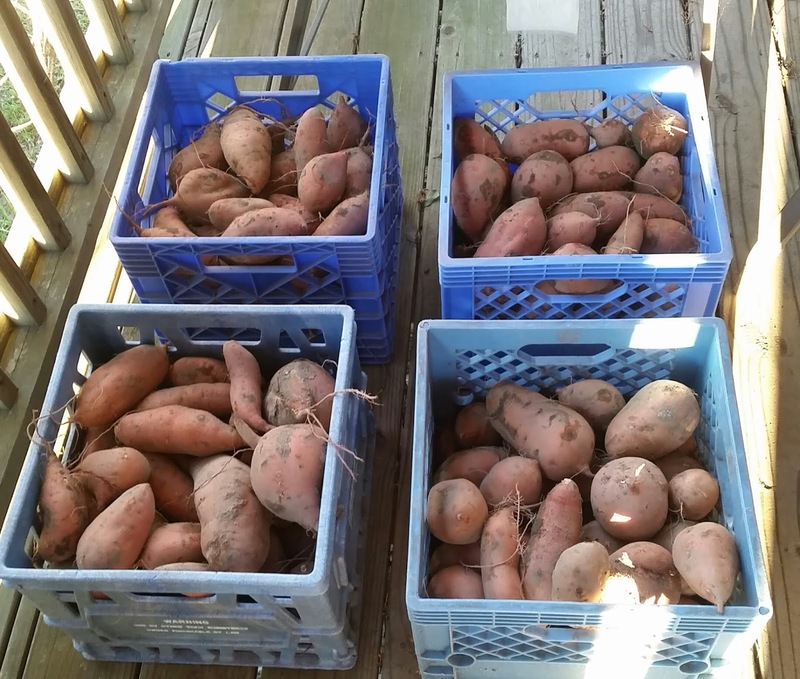 We were able to glean sweet potatoes from a nearby field. The farmer allows others to glean his fields once he’s through harvesting. 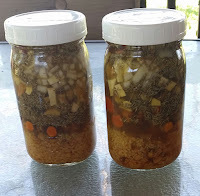 I'll let the potatoes 'cure' for 2 - 3 weeks, then I'll start preserving them. I had two butternut squash and one spaghetti squash that we brought back from our travels in September so I set about cooking them in the crockpot. 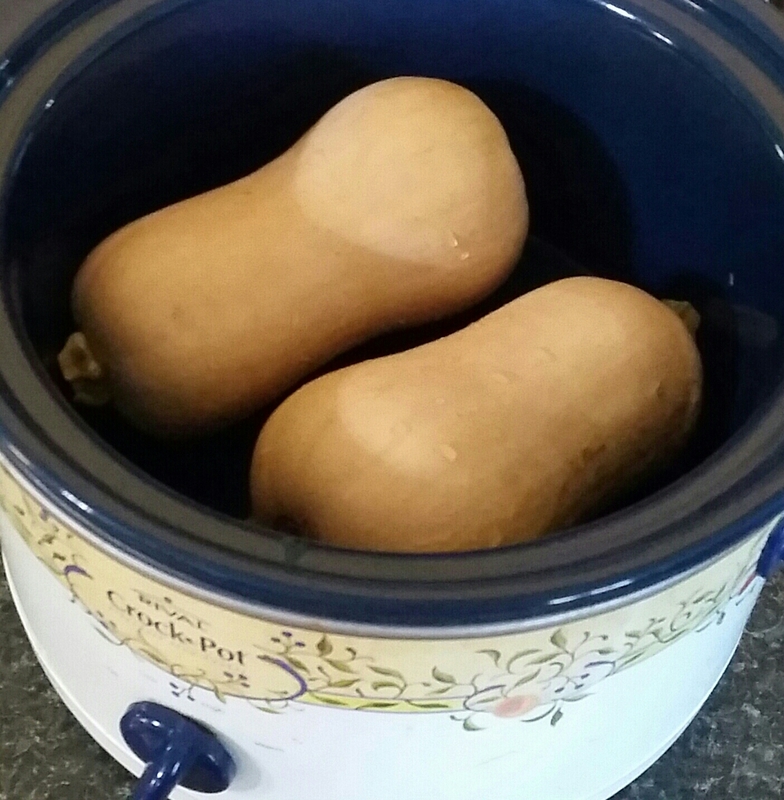 I cleaned them, put them in the crockpot, added ½ cup water and cooked them on high for 2 – 3 hours. I checked them by piercing them with a fork to check their doneness and then turned them off to cool with the crockpot lid slid to the side so that it wouldn’t hold heat. When they were cool, I sliced them in half, removed seeds and pulled the ‘meat’ out. I then placed the meat in the refrigerator to be used in an upcoming meal. This method is so much easier than trying to cut them open with their hard peelings! That’s it for me this week, what about you? 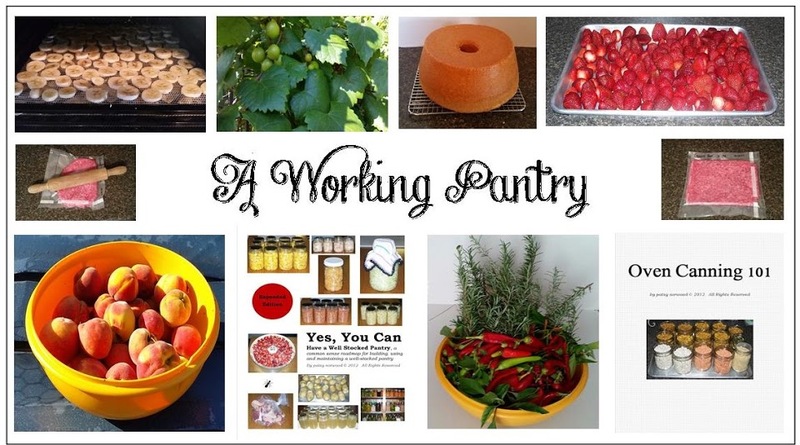 How did you save money, live frugally or build up your pantry? We are due to possibly get our first frost tomorrow night here in SW MO. I picked all the beets that were left in the garden, separated them, went through the greens and got 2 bags to freeze. The few that were left over will be used like Hot Spinach Salad. Hubby brought in turnips and I brought in the two parsley plants. took out the oregano that was done in the dehydrator and filled it up with Parsley. Need to pot up the Rosemary plant also. Haven't decided how I will do the beets. I have a taste for pickled beets. I have two cats that need to see the vet, so time will be at a premium. Also have to see what's left on the pepper plants. Why do we have to go from 90 to 30 in just a few days?? Kristine, we're still quite warm here although the past couple of days have been cooler. We've enjoyed them a lot and tried to get as much outside stuff done as possible before the warmer temperatures move back in later this week. It'll be a few more weeks before we start moving things into the greenhouse here. Stay warm! Hi Patsy you did so well considering all the welfare work you were doing during the week. It is amazing you got so many other things done and those sweet potatoes will make a lot of lovely meals. Previously we blanched and froze over time around 60 kg of them to last us a year which are now in the freezer. A bit of good news on the home front here is that we saw a property to buy we had been keeping our eye on on the internet for about 4 - 6 months that was reduced by over $50 000. We put in an offer on it and our offer for less than the asking price was accepted, we have signed a contract and have conditional finance approval from the bank. We will find out whether we have unconditional bank finance at the end of next week. Keep us in your prayers everyone. Not a lot done this week with racing backwards and forwards to solicitors, the bank, getting quotes on car, house and contents insurance. - Banked more money into our home deposit savings account. - I listed more items on eBay using a free listing promotion. - DH managed to get 2 pairs of dress pants from BigW for $93.90 less than the usual place shop he buys them from and they are about the same quality :). - We washed all washing in cold water, hung it on the clothes line to dry and used saved grey water to water the household lawns with. - Used saved shower warm up water to water the fruit trees and new seeds planted in the gardens. - We picked a heap of thyme, French and English lavender from the gardens and are now drying it to sell and some for the home. I hope everyone has had an equally wonderful week :). Sewingcreations15, that is wonderful news about the property, I will be praying. I look forward to hearing that you're going to have a new home of your own! Good news! Congratulations on the property! Thank you Lana for your encouragement :) . Hi Patsy and thank you we could do with all the prayers sent our way and appreciate your encouragement :). Patsi, so glad both those hurricanes are over but I daresay the cleaning up will take a long time for those who were hit. You must be so very pleased to be able to stay home and get back to normal once again. 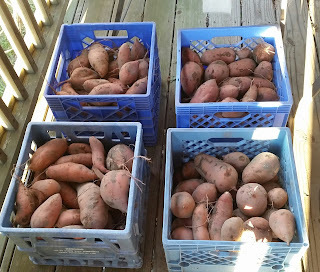 I love the sweet potatoes, how neat that you're able to get them for free. Those will definitely keep you busy! I cooked and froze five butternut squash this week as well. I too cook mine from whole; they're so terrible to try to cut through! Once I learned that they could be tossed in the oven whole, I've never tried them any other way. I have terrible memories of spending my daughter's entire naptime sawing through butternut squash when she was little. Thank goodness for learning things from the internet! This week, I have FAR too much to do, and too little time to get it done, but I'll manage somehow. :) Continued well-wishes for your family and your area's hurricane recovery! Stephanie, how do you freeze your butternut squash and what do you use it for? I've never frozen it … believe it or not we just within the last year discovered how much we like it!!! Not the answer on the squash questions but did you know that you can bake sweet potatoes and freeze them in the skin? Thaw and the skins slip right off and they are sweet and delicious. They keep for a year in the freezer. Lana, yes, this is one way we preserve sweet potatoes every year!!! I am happy to hear that you are getting back to normal at your house. Thanks for the information on preserving the basil. I still have a lot growing and next week will be the end of it with the low temps that are predicted. Last week I got lemons on sale and froze a whole tray of wedges for later. It is good to know that we have fresh lemons when we need them. We are heading for the lake on Sunday for 2 weeks so this week is crunch time for getting things done so that we can be gone for that long. Our neighbor boys were here helping to clean up the yard from the two hurricanes. It is a blessing to have them be able to help and they like earning the money. We have to mow and put away the flower pots and get the ones we will over winter into the garage. Hubby is out in the driveway winterizing the camper van so that the pipes do not freeze. Have a great week all. I am praying that we do not have to go through anymore hurricanes this year. Lana, enjoy your 2 weeks away … that sounds like a little bit of paradise to me right now! I am so glad you made it through Florence and Michael. The fact you have energy at all, after all you have done for disaster release, is amazing. I hope that you will be able to focus on yourselves and your own home for just a little while. We have had some storms of late and have had severe weather warnings. So far we have missed the damage but others have not been so lucky. In our area the local farmers have their rain water tanks full and their livestock dams are on the way to being full. This is a big relief. We were gifted a large bag of sweet potato. We have shared these out with our neighbours but still have plenty for us. The rain has revived my parched garden and things are beginning to take off. The tropical fruit trees are all in flower an even though a few have been lost to the storms, the fruit set is looking hopeful. I can see the mangoes on the neighbours tree and am so hoping we can beat the fruit bats to this bounty. Due to being stuck inside with the weather, I have been sewing up a storm. My Christmas gifts are coming along nicely. I am hoping to be finished, or close to it, by the end of the month. Jane, Christmas!!!! I haven't even started yet! I would love to see pictures of the things you're stitching up! I am new to cooking spaghetti squash.I do realize your life is super crazy with all the chaos from the hurricanes. If you have any recipes or advice on using it up or how well it works in leftovers I'd love to hear about it. 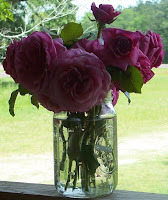 I follow your blog & have loved all the helpful information you share. My goodness, you have had a busy month! While you must be exhausted, there has to be some comfort in doing some normal home stuff again. At least, I sure hope so! I know that after I've had big events, I even enjoyed the mundane of just doing dishes again. All the work you did helping others was incredibly kind. Debby, it feels so good to do 'our normal' things again! I am so enjoying doing the ordinary things!!! 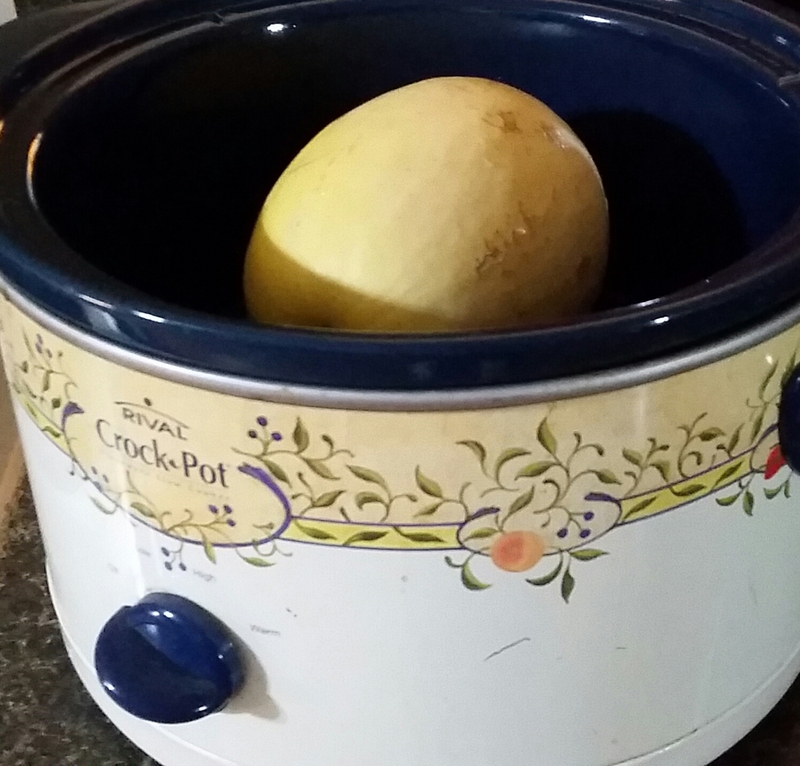 I promised myself all year that this was the fall I learned to cook a spaghetti squash! I was at Sprout's this morning and my lovely specimen is on my counter. 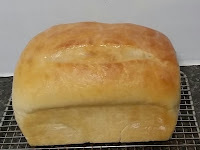 I found a recipe online that seems simple & tasty enough so I'll report back when I've tried it. Debby, we love to shop at Sprouts! I'll look forward to hearing how the recipe went.